This compelling contribution to contemporary debates about the banking industry offers a unique perspective on its geographical and conceptual ‘placement’. It traces the evolving links between the two, revealing how our notions of banking ‘productiveness’ have evolved alongside the shifting loci of banking activity. Brett Christophers is Assistant Professor in the Department of Social and Economic Geography and the Institute for Housing and Urban Research at the University of Uppsala, Sweden. He holds degrees from the Universities of Oxford, UK, British Columbia, Canada, and Auckland, New Zealand, and is the author of Positioning the Missionary: John Booth Good and the Confluence of Cultures in Nineteenth-Century British Columbia (1998) and Envisioning Media Power: On Capital and Geographies of Television (2009). 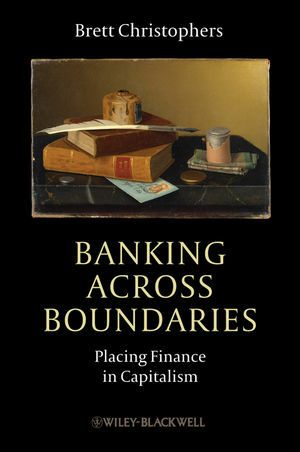 "Banking Across Boundaries: Placing Finance in Capitalism [is] a probing examination of the boundaries, conceptual and geographic, at stake in financial intermediation. ... [Christophers] succeeds in uncovering fresh connections between material and discursive change, ranging across centuries of financial history, while profitably assimilating various theoretical and empirical literatures, including, but not limited to, critical accounting studies, the sociology of finance, international political economy, and Christophers’ home discipline of human geography. It is done with admirable fluency and alacrity." "Brett Christophers has written a wide-ranging, brilliant, and imaginative book about one of the most important topics in contemporary social science—the role of banks in the contemporary global economy." "BAB is an important book that gives us important correctives to established narratives."